Capsicum – 1 large sized. Jeera powder – 1 tsp. whole jeera – 1 tbsp. Dhania powder – 1 tsp. Garam masala – 1 tsp. Red chili powder – 1 tsp. Ginger garlic paste- 1 tsp. Heat some oil in a pan and add jeera and wait until it starts to splutter.Add the ginger garlic paste and saute for few minutes. Add the diced capsicum and the peas to the pan and saute for five minutes. Add the garam masala,chilli powder,salt,jeera powder and dhania powder and saute for few minutes. Cook the 2 cups of rice in 4 1/2 cups of water and keep it ready. Now add the capsicum and peas to the rice and mix well. 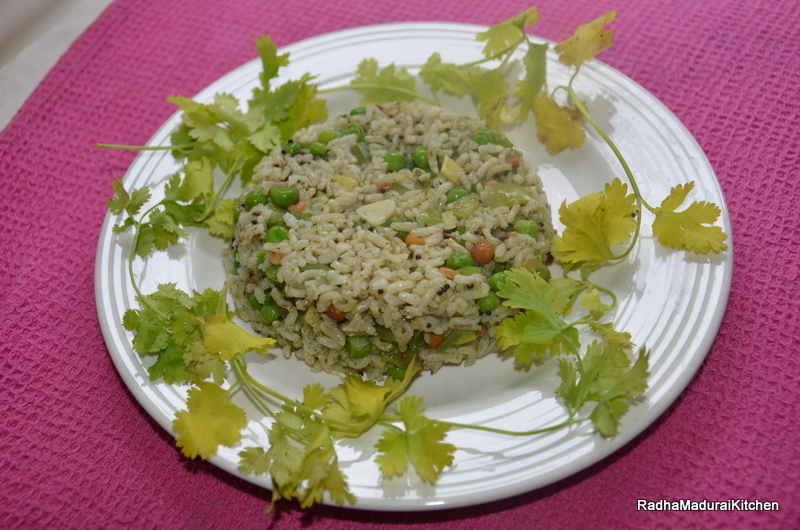 This rice can be served with onion raita.